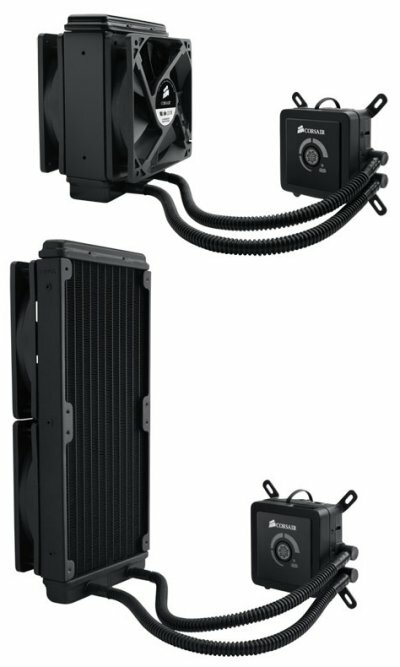 Corsair®, a worldwide designer and supplier of high-performance components to the PC gaming hardware market, today announced two new models in its award-winning Hydro Series™ family of high-performance liquid CPU coolers. The Hydro Series H80 and H100 feature the latest cooling performance technology, simple installation, and maintenance-free operation. Both include a low-profile, light-weight cooling unit with a micro-channel copper cold plate and a split-flow manifold for superior cooling, and digital fan control, allowing the user to select between low-noise, balanced, and maximum cooling modes. The H80 includes a double-thick 120mm radiator for compatibility with virtually all standard ATX PC cases. The top-of-the-line H100 uses a dual 120mm radiator for even better performance, and is compatible with PC cases that provide mounting capability for a standard 240mm radiator. Both the H80 and H100 include a Corsair Link digital connector, allowing them to take full advantage of the new Corsair Link™ system for monitoring and control. For systems with the Corsair Link Commander hardware installed, users have even more control of cooling performance and sound levels. "With the H80 and H100, we've kept our focus on the key features that have made the Hydro Series a success — closed-loop reliability, straightforward installation, and, of course, the best CPU cooling technology available." said Ruben Mookerjee, VP and General Manager for Components at Corsair. "The user-selectable fan control and Corsair Link Digital compatibility gives performance enthusiasts the power to customize their cooling performance and manage fan noise by selecting the amount of cooling they need." The Hydro Series H80 and H100 will be available from Corsair-authorized retailers worldwide in June. The Hydro Series H80 will be available for a US suggested retail price of $109 USD, and the Hydro Series H100 will be available for a US suggested retail price of $119 USD.